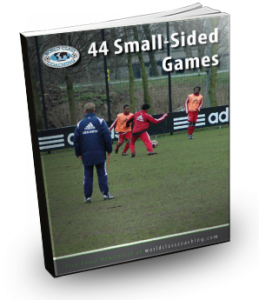 Do you want your team to be better at possessing the ball? Do you want your team to be better transitioning from offense and defense? Do you want to improve your team’s fitness? The drill below by World Class Coaching can help with all three areas. 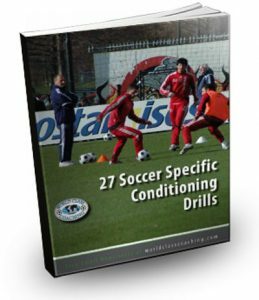 The drill is set up with two groups of seven players in a sixty yard long space from the midfield line to the 18 yard box line that is split up into two sections. The first game involves both teams playing keep away and trying to make six consecutive passes in their attaching half of the grid. For each six consecutive passes, teams get a point or goal and can keep going until the other team wins the ball or there is a change of possession. The coach in this drill assigns each player on each team a number from one to seven. If a ball does go out of bounds, a number is called out and the players with that number must sprint to an extra ball on the side of the grid. The first player to a ball gets to restart the game and start a new possession for his or her team. Everything about this drill focuses on possession. There are no goals to score on and to win, your team must pass and keep the ball. The possession game is extremely important in every soccer game as teams that control the ball normally have better opportunities to attack and ultimately score goals. This doesn’t mean the team that has the most possession wins every game, buts it’s a good indicator of the strong and more technical team. Players should be instructed to make quick transitions from offense to defense, as well as defense to offense during this drill. The focus on defense should always be to put pressure on the offensive team to win the ball back. Once this happens, players must quickly transition to keeping the ball while spreading out and finding open space. These transitions happen all the time during a game and are critical if your team wants to be successful. The reason the consecutive passes must be done in each team’s offensive half is to encourage players to move the ball while attacking. If a player makes a mistake or the ball is taken away, this normally does not hurt the team too much in their offensive half. If this would occur in their defensive half, the result could be much more severe with possibly getting scored on by the other team. World Class Coaching offers many great coaching tools. At the bottom of this post you will find links to three free e-Books that they are offering.